The Phantom 4 is a refinement of the Phantom 3 Professional. There are tweaks to the camera's performance, but the major upgrades are the robust design, improved materials, and clever flight aids using new sensors. This makes the Phantom 4 a worthwhile upgrade over the Phantom 3 Professional, and an even better choice for photographers who need a sturdy piece of kit that will deliver great results. DJI has been a major innovator in the drone market with its ready-to-go Phantom series. Since the Phantom 2 Vision this line has been equipped with a high-quality camera alongside 'smart' flight controls that make it possible for anyone to fly one with no prior experience, making it popular with hobbyists and professionals alike. It's been less than a year since the release of the Phantom 3 Professional, but drone technology is advancing rapidly, and now DJI has introduced the Phantom 4. It's a refinement of the Phantom 3 Professional, with a beefed-up design, improved intelligent flight options, and a new and very clever object-avoidance system. 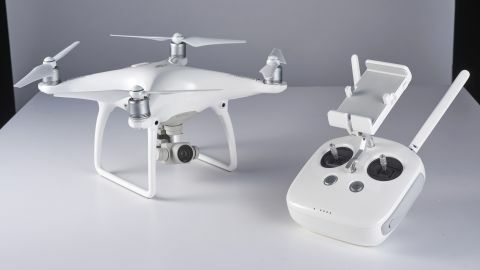 All this makes the Phantom 4 an appealing option for jobbing photographers who need a solid, easy to use drone that will enable them to capture great aerial shots (subject to them obtaining the required commercial licence). Being able to see what you're filming is essential, and this is one of the areas in which the DJI Phantom has excelled. The live stream can be viewed on a connected phone or tablet via the DJI Pilot app for Android and iOS. The Phantom 4's new stockier design sees the old plastic body replaced with a sleek magnesium alloy, finished in glossy white. The camera and gimbal design are improved, and are better integrated into the body, making the whole setup feel more robust. Essentially the camera remains much the same as on the Phantom 3 Professional. It has a 1/2.3-inch sensor and an f/2.8 lens with a 94 degree field of view and an equivalent 35mm focal length of 20mm. However, the specifications of the 4K camera bring a few resolution and frame rate improvements. At 1080p the camera takes a leap from a maximum of 60fps to 120fps. There's also a change to the top end resolutions and frame rates, with an additional 3840 x 2160 (4K) option alongside the existing 4096 x 2160 (4K), and a new 2704 x 1520 (2.7K) option. As with the 3 Professional, the 4 features the ground-facing positioning cameras that help to stabilise the flight of the drone. These cameras are now joined by two front-facing sensors that are able to detect objects in the drone's flight path. Short battery life has been an issue with previous Phantoms, and DJI has moved to address this in the Phantom 4 with a battery that extends flight times by a quoted 25%. Previous Phantoms have been constructed from plastic, and while this makes them lightweight it also makes them susceptible to damage if crashed. The Phantom 4 features an ultra-lightweight magnesium alloy body finished in a brilliant white. It feels far more solid than the Phantom 3 and weighs 100g more, tipping the scales at 1,380g. The physical design of the camera has been refined, and part of the 4's bulk can be attributed to the partial integration of the gimbal into the body of the drone and the new larger battery. The other big change is in the design of the propellers – they're now of the quick-release style, similar to those on the Inspire range of quadcopters. Preparing the Phantom for its first flight requires the battery and propellers to be fitted, but this takes less than a minute. The final step before take-off is to connect the Phantom to a mobile device. Unlike drones such as the 3DR SOLO, the Phantom uses a physical wired connection between mobile device and handset. This has the advantage of a fast, secure connection, and doesn't require a Wi-Fi connection to be made out in the field. Once the drone is assembled and your mobile device is connected the controller can be switched on, followed by the Phantom 4. It's then just a case of waiting for 6 GPS satellites to be picked up before you take to the air. The time taken to make the GPS connections varies between a few seconds to a few minutes, depending on the conditions, but I never had to wait more than a couple of minutes. Return to Home (RTH) mode is enabled automatically when the drone takes off, but it can also be set manually. This is one of the most important features you need to be aware of, as if it all goes wrong it will help to avoid 'flyaways'. On both the handset and app there are RTH buttons that can be pushed to automatically bring the drone back to the take-off point. Another button on the controller, the pause button, is used to stop the drone and make it hover, which can be very handy, especially if you lose depth perception and/or orientation. You also have the option to set the maximum flight distance and height, which is useful in all sorts of situations, especially if there are flight restrictions. The Phantom 4 is powered by a single battery which slots into the rear of the craft. The battery features a set of lights that indicate the amount of charge left, giving a handy visual guide to flight times. As mentioned, the battery has a slightly larger capacity than the one that shipped with the Phantom 3, and enables 28 minutes of 'average' flight. Older DJI batteries are not compatible with the Phantom 4, however, which is a blow if you've recently invested in batteries for the 3. It's advisable to never let the battery drop below 25% charge, and from fully charged I found that I could get 15-20 minutes of flight before falling to that level, compared with 12-15 minutes with the Phantom 3. Using the Phantom for image capture is extremely straightforward, with direct controls available on the handset and in the app. The gimbal and camera are controlled through the app, and some camera options can be adjusted by using the scroll wheel on the right of the handset; clicking down on the wheel enables you to toggle between the sensitivity (ISO) and shutter speed settings. Other settings, including frame rates and resolutions, can be changed through the apps interface, and it's easy enough to quickly switch between stills and video. There are Auto and Manual options for both stills and video, which can also be selected through the app. Manual mode enables you to adjust settings such as sensitivity, from ISO100-3200 in video mode and ISO100-1600 for stills. The shutter speed can be adjusted from 8 seconds to 1/8000 sec. As the controller design is the same as the Phantom 3's the camera can still be tilted up and down by the left-hand scroll wheel on the handset. Panning is, of course, controlled by rotating the craft in flight. The app offers direct access to all flight features, manual, assisted and automatic, and these can be selected by tapping the icons on screen.